Please select an option from one of the drop-down menus below to begin your search. Patel, Krunal Caletri, David Boyer, Cynthia Castine, Michael Scallan, Elise Hansbrough, Thomas A. Pirzadah, Mohammad Zohair Peters, Stanley E. MD, Jon G. Traxler Peters, Geoffrey M. Boone, Ryan Mitchell, Charles LeBlanc, Charles Yadlapati, Siva Shows, Ryan Cataldo, Vince Lindow, Kyle Alombro, Clinton Myles, Bevan Bland, Samantha Bliss, Ryan Agarwal, Nayan Allemond, Jason P. Anderson, Jess Best, Joshua Bourgeois, Dan Brown, Clayton Corona, Raynold J. Cossé, Michelle Couvillion, Aerin Drennan, Robert Elbourne, Keith Elkins, Reagan Folse, T'lane Freeman, Will Gautreaux, Nikki Giarrusso, Brad Giuffre, Brent Gould, Tommy Griffin, Joseph Grissom, Robert Harrington, Laurie Jasti, Babu Kakarala, Venu Kraft, Leon Lauve, Andrew Lea, Amanda LeBas, Jacob Longmire, David Luscy, C. Peter Manalac, Rodolfo Mathews, Ronnie Mazoch, Brent Mazoch, Lisa Mouton, Mark Muhumuza, Robert Nesheiwat, Joseph O'Laughlin, Heather O'Neal, Jeremy C. Jones, Allison Posner, Mark Rabalais, David Rathbone, Richard Rhodes, Kent Romaguera, Michael Russell, William Sanfiel, Frank Santos-Mata, Elenita Schwab, Kyle Setser, Bradley S. Sharp, Cary J. Smith, Brad Speeg, Stephen Talbot, Amanda Taylor, Robert Thekkoott, Deepak Thompson, E. Gene Thompson, Charles Trahan, Thomas Vick, Stephen Ward, Gregory Whatley, Adam Wilkes, Greta Monroe Williamson, Baron Worley, Michael Yegge, James E.
Dr. Frank Sanfiel graduated from Loyola University in New Orleans and received his medical degree from Meharry Medical College in Nashville, Tennessee. He completed residency training at the University of Kentucky in Lexington, received an Executive Healthcare MBA from George Washington University in Washington, D.C., and a Fellowship in minimally invasive surgery from Tulane University in New Orleans. 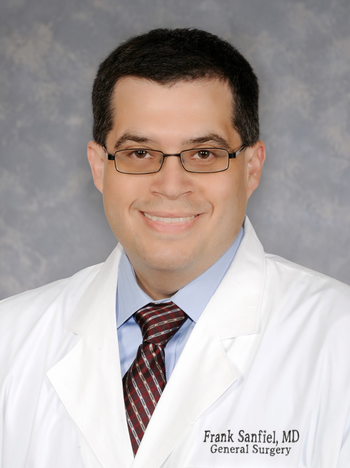 Dr. Sanfiel specializes in a broad range of general surgery, including colorectal, breast, endoscopy, laparoscopy and robotics. Dr. Sanfiel is board certified in General Surgery by the American Board of Surgery and is a member of the American College of Surgeons.